↑ Farhad Heydari (October 2009). "The World's Scariest Runways". Travel & Leisure. अभिगमन तिथि 12 फ़रवरी 2011. 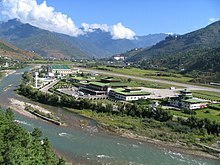 ↑ "Paro Bhutan". Air Transport Intelligence. Reed Business Information. 2011. अभिगमन तिथि 12 फ़रवरी 2011. ↑ Gyalsten K Dorji (19 दिसम्बर 2011). "On Drukair 's historic flight". Kuensel. अभिगमन तिथि 18 जनवरी 2012.